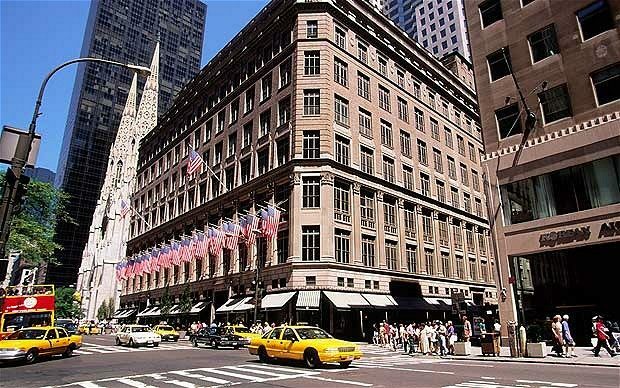 A trip to New York would not be complete without a visit to New Yorks’ most famous shopping district Fifth Avenue. For visitors looking for the ideal Manhattan New York Hotel, Fitzpatrick Manhattan Hotel is located a mere stone throws away form Fifth Avenue making it the perfect location for your 5th avenue shopping. In the heart of Manhattan, and considered one of the most famous and expensive shopping streets in the world, 5th avenue shopping is one of the not to be missed experiences of New York. The famous shopping district starts at Washington Square in Greenwich Village and stretches up to West 143rd street in Harlem. If you are looking for a more exclusive and prestigious 5th avenue shopping experience, the midtown section between 49th and 60th street boasts the highest concentration of the most prestigious shops and flagship stores. Versace, Tiffany’s, Prada, Gucci and Bulgari are just some of the high-end stores you will find here. If you have the kids in tow, 5th avenue is also home to the world’s largest build- a-teddy bear-do-it-yourself store. FAO Schwarz is a must as well for those with kids and those big kids! For those after more budget conscious shopping, there are a few high street stores such as Abercrombie & Fitch and H & M.
If all that 5th avenue shopping has gotten the better of your wallet, the famous shopping district is full of interesting architectural buildings with neo-gothic, neo-classical and art noveau- elements such as the Aeolian Building, the Gorham Building and the Rizzoli Building to name a few. Iconic New York landmarks also feature greatly on 5th avenue, the Empire State Building, the Rockefeller Center, St. Patricks Cathedral and the Public Library are A trip to New York would not be complete without a visit to New Yorks’ most famous shopping district Fifth Avenue. For visitors looking for the ideal Manhattan New York Hotel, Fitzpatrick Manhattan Hotel is located a mere stone throws away form Fifth Avenue making it the perfect location for your 5th avenue shopping. If all that 5th avenue shopping has gotten the better of your wallet, the famous shopping district is full of interesting architectural buildings with neo-gothic, neo-classical and art noveau- elements such as the Aeolian Building, the Gorham Building and the Rizzoli Building to name a few. Iconic New York landmarks also feature greatly on 5th avenue, the Empire State Building, the Rockefeller Center, St. Patricks Cathedral and the Public Library are all well worth a visit. Many of New York’s best museums can be found on the aptly named “Museum Mile”, the section of 5th avenue that passes the Upper East Side. The Metropolitan Museum of ART, the Museum of African Art, the Jewish Museum and the Guggenheim Collection are all found on this cultural strip. For those visiting New York during the holiday season, they will be treated to wonderfully creative window displays from Saks, Tiffany’s and Bergdorf Goodman. The parades also traditionally march through 5th avenue, those visiting around Saint Patrick’s Day and Thanksgiving will be able to see the parades from this famous avenue. Fitzpatrick Manhattan Hotel provides the perfect base for those looking for a central location in New York and a relaxing comfortable retreat after an active day in the city. Unlike other hotels in Manhattan, the Fitzpatrick Manhattan Hotel is both spacious and relaxing despite its extremely central location. The rooms range from our deluxe rooms to suites and presidential suites all providing a relaxing comfortable haven to escape the city after a long day sightseeing, shopping and exploring the city. The Fitz in Fitzpatrick Manhattan is ideal for a leisurely breakfast, quick business lunch or cocktail after a full day of exploring the city. The soothing blue tones and rich dark wood panelling create a relaxing atmosphere. The Wheeltapper in Fitzpatrick Grand Central Hotel part of the Fitzpatrick Group is renowned as one of the best Irish pubs in New York. The Wheeltapper celebrates the best of a traditional Irish pub, providing its patrons with contemporary food and drink in a relaxed informal atmosphere. This restaurant and bar are the perfect spot for a drink, lunch, breakfast or dinner all year around with a heated outdoor Patio comfortable seating and indoor fireplace.